A spectacular solar event over the weekend provided a stunning showing of the northern lights, or aurora borealis. This image by Stefan Ingvar Gudmundsson from Iceland captures the lights appearing to curl around the Snaefellsjokull glacier. They are one of nature's most spectacular sites: The aurora borealis, or northern lights as they are known, have captivated onlookers for thousands of years. This past weekend saw a particularly stunning display following a phenomenon known as a coronal mass ejection, where the sun spews a burst of particles into space that reach Earth one to three days later. Bursts toward earth can cause electromagnetic storms when they react with the Earth's magnetic field, resulting in an explosion of color in the sky. My brother suggested I may like this website. He was entirely right. This put up truly made my day. You cann't believe simply how so much time I had spent for this info! Thanks! As a scientist I think the northern lights are pretty. 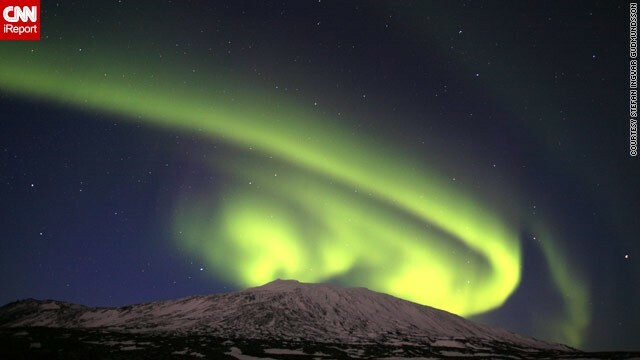 These northern lights prove man never went to the moon. They are caused by deadly radiation that would fry an astronauts innerds in seconds. Any human encountering the level of radiation necessary to produce the northern lights would instantly perish. No amount of tin foil as used on the Apollo ships would protect living organisms from such a catastrophic fate. Dude... this is a science blog... nobody cares about your delusions. Only to the point where I hope you never reproduce or succeed in propogating your hate filled beLIEfs on anyone else... other than that... Nope!